In 2014, our family had a big author birthday celebration for Anne Rockwell. 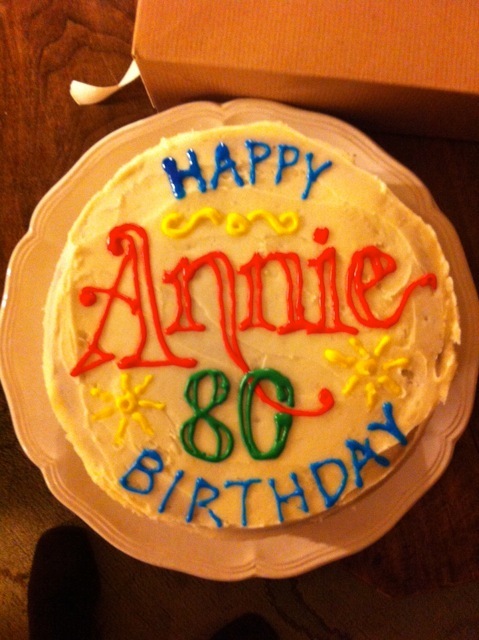 A few weeks later I received an email from Lizzy Rockwell, Anne's daughter and children's book illustrator, thanking us for celebrating her mom's 80th birthday! Included in the email was a picture of her mom's birthday cake. Lizzy's email made me very happy. I often wonder who reads our blog and when Lizzy Rockwell wrote to tell me that she "stumbled across" it. It made my day, week, month, and year! Just imagine how excited I was when I had the chance to meet and spend time with Lizzy at the Mazza Museum Summer Conference in July 2016. 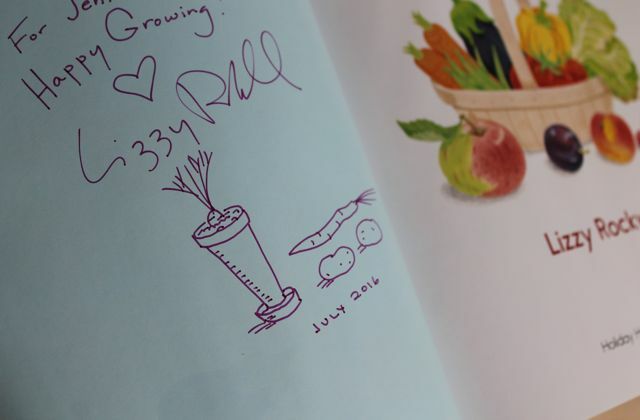 I neglected to get a photo of me with her at the conference, but check out the personalization she did for my son in his copy of Plants Feed Me. This book was supposed to be for Christmas, but I couldn't wait. I gave it to him this week and he loved it! I wish you could have seen his smile when he saw the drawing! I explained to Lizzy that my son loves gardening so much he is growing carrots in pots on our deck. So, she doodled a carrot in a pot for him. It was perfect! Lizzy Rockwell has illustrated over 25 books including Good Enough to Eat: A Kid's Guide to Food and Nutrition, The Busy Body Book: A Kid's Guide to Fitness, and Hello Baby!. 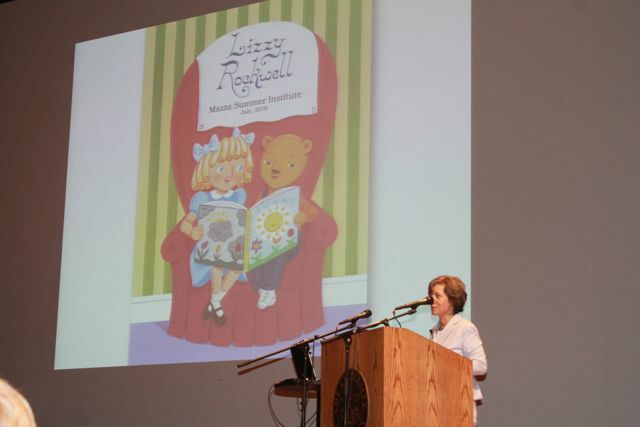 Lizzy Rockwell told the audience at the Mazza Museum Summer Conference 2016, "Books were a vital part of my childhood." 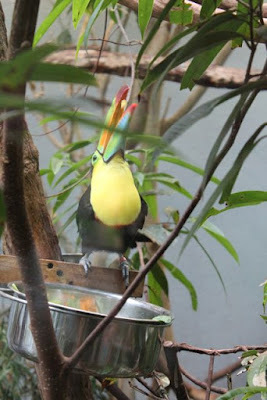 The books Lizzy loved to read were science field guides and picture books. Especially picture books by Lois Lenski, Wanda Gag, and her parents Harlow and Anne Rockwell. Her parents' art studio was in their home and it was "the first place [Lizzy and her siblings] went after school." 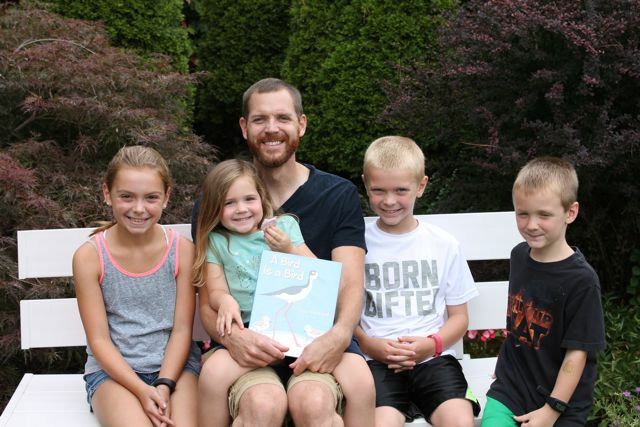 (Pass It Down: Five Picture Book Families Make Their Mark). As you can imagine with an art studio in her home it wasn't hard to find art supplies. On Lizzy's website she described this, "My brother and sister and I were always drawing and coming up with stories...My sister and I spent hours copying photos in fashion magazines and album covers." 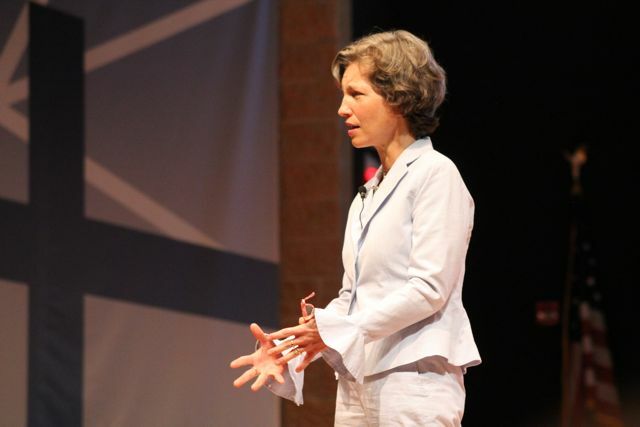 "A healthy community has arts and literacy." In an interview with Got Story Countdown Lizzy said, "Growing up in my family was quite an adventure. Along with all the cultural immersion right in our home in the form of books, music and art supplies, we spent many weeks of many summers traveling around France, Italy, and England. We were exposed to a lot of beautiful art and architecture." All the exposure to art led Lizzy to attend Connecticut College to study art and art history. 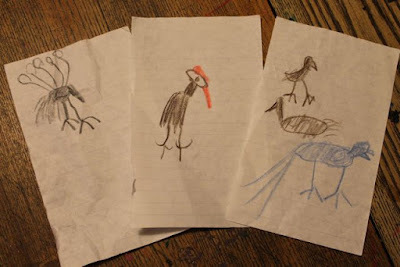 However, Lizzy was reluctant to fully commit to becoming an art historian and with some encouragement from her father she decided to pursue illustration. She studied illustration at the School of Visual Arts in New York City and moved back home to strengthen her portfolio. She did freelance work creating book jackets and illustrations for magazines. 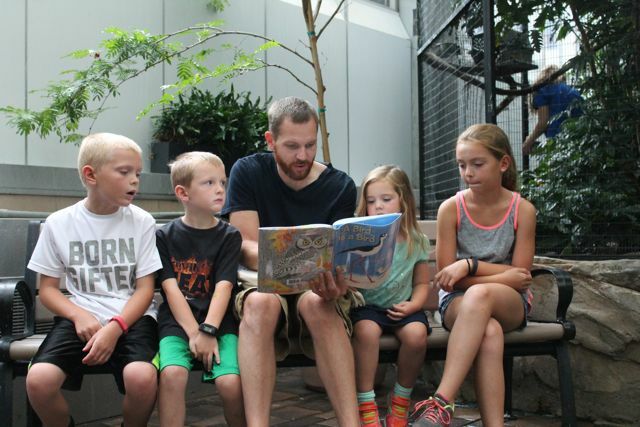 "I like making books for the child audience...Picture books are a unique and powerful media." In 1988, Lizzy's father died after a lengthy battle with illness. He was working on the book My Spring Robin and with the book two-thirds complete Lizzy "sat at the drawing table and finished the last few pictures" in her Dad's style. This was the third book in a series of four and the publisher chose Lizzy to finish the series and illustrate her first picture book, Apples and Pumpkins, written by her mother. 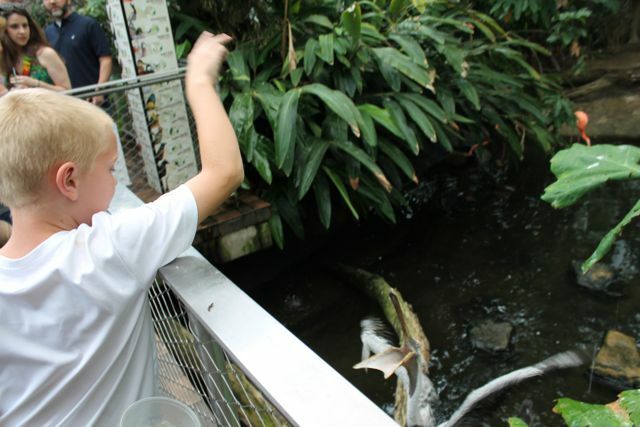 Lizzy described this experience as "an apprenticeship" and was "really proud to carry it on." (Mazza Museum Keynote). Lizzy and her mother have collaborated on over 20 books together including Career Day, 100 Days of School, and Father's Day (all of these books were featured in our Anne Rockwell Reading Experience). Their latest book together is Library Day, A My First Experience Book which was released in January 2016. The next in the series is Zoo Day which will be available in January 2017. 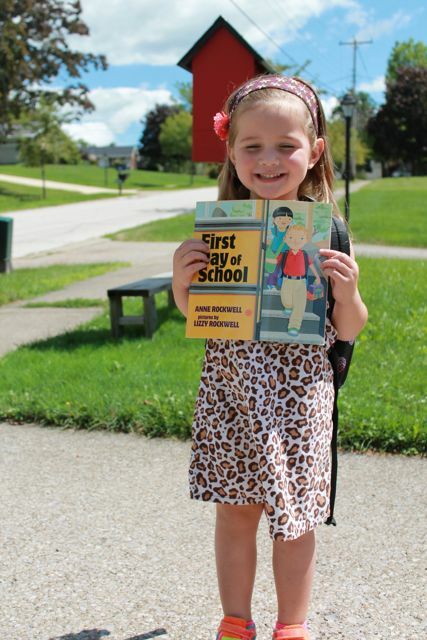 In addition to collaborating with her mom, Lizzy has written many of her own books. 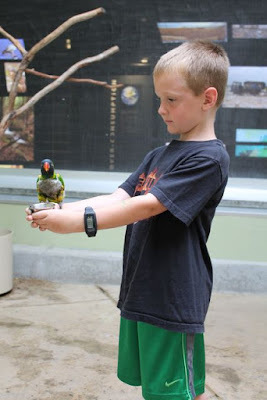 One of our favorites is A Bird is a Bird and it was the inspiration for our author birthday celebration activity. Lizzy came up with the idea for this book when she was looking through the New York state curriculum standards. In the book, readers will learn that a bird is a bird because it has a beak, wings, and hatches from an egg. 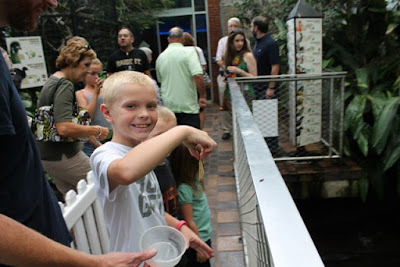 But, wait...insects have wings and snakes hatch from eggs. 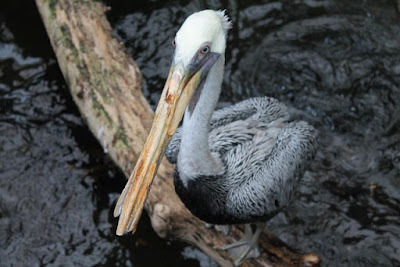 And a platypus has a beak. 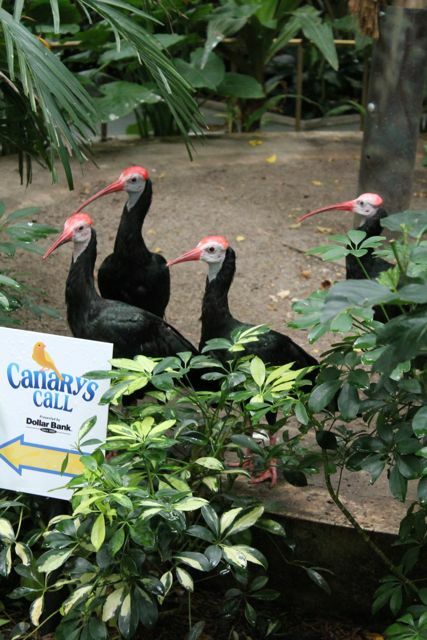 Are they birds? Of course not! 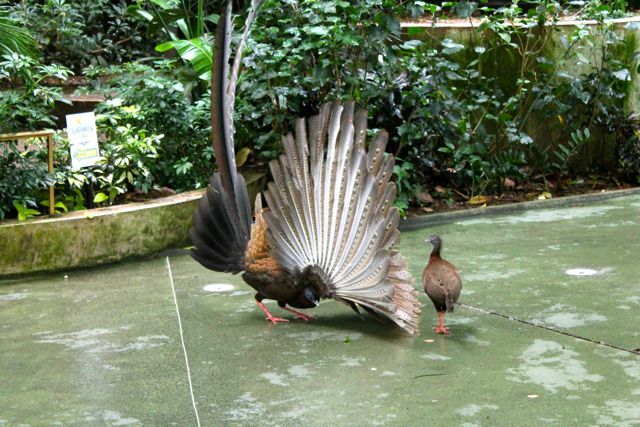 They are missing another key characteristic of birds...feathers! 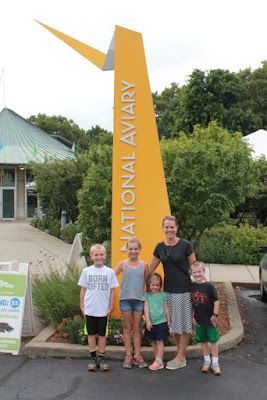 We took this photo as soon as we arrived at the National Aviary or as my youngest daughter called it...The Bird Zoo! We saw birds using their beaks to eat. 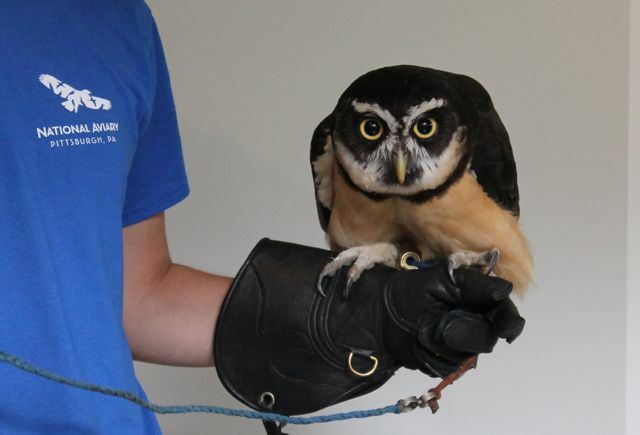 We met birds up close like this Spectacled Owl. 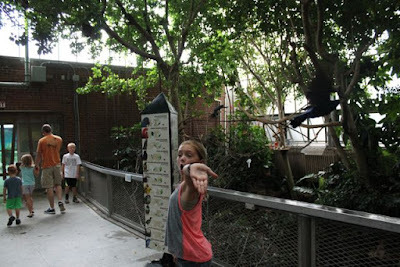 We played with the birds too! 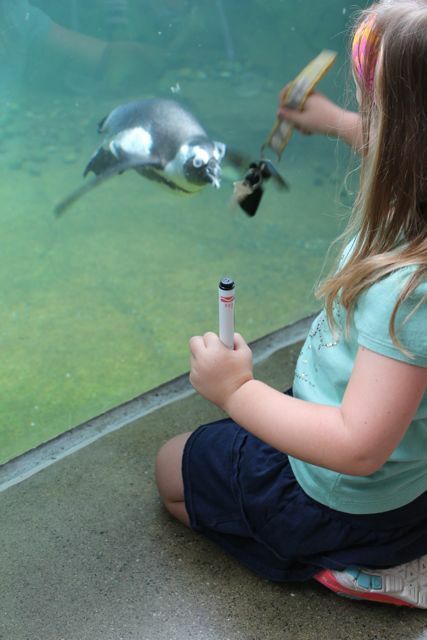 This African Penguin loved our van keys. 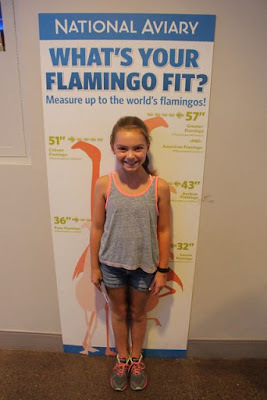 My oldest daughter is as tall as a Greater Flamingo. I also have children the size of the Chilean Flamingo, the Andean Flamingo, and the Puna Flamingo. 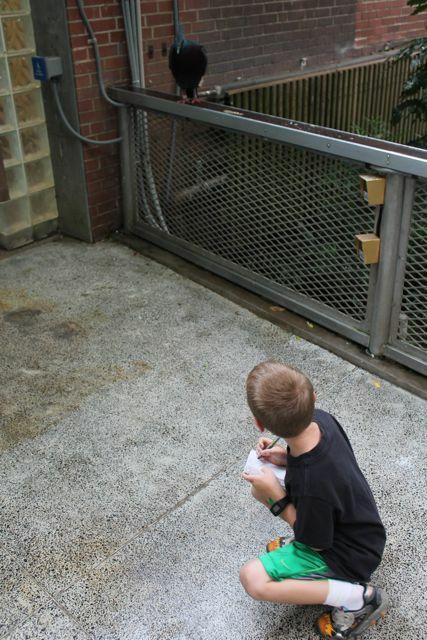 In the Rainforest room, my youngest son needed to sketch the birds he saw. Here he is observing a Victoria Crowned Pigeon. Here are a few of his sketches. 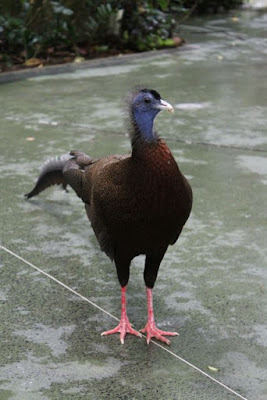 The Victoria Crowned Pigeon is one the left. Here is a photograph of the Great Argus Pheasant and his mate. Their names are Gus and Mrs. Gus. 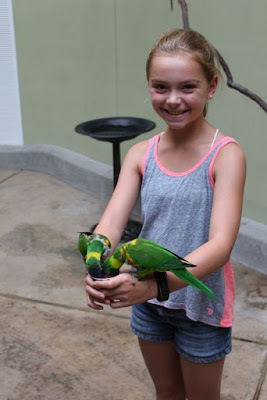 My daughter was so excited to feed a lorikeet. 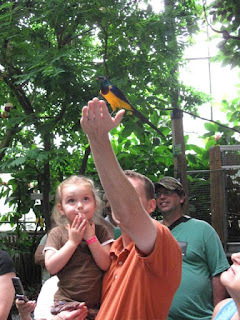 This photo is from the only other time we have visited the National Aviary. It was seven years ago! It was his first time at the National Aviary and it was his first time feeding a lorikeet too. He couldn't believe that one bird drank all his nectar! 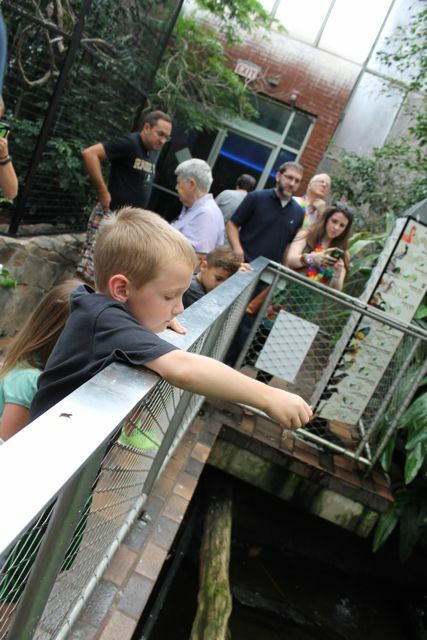 We went back into the Rainforest room and Gus was no longer courting Mrs. Gus. Here is a close-up picture of him. My daughter caught me being a blogger! 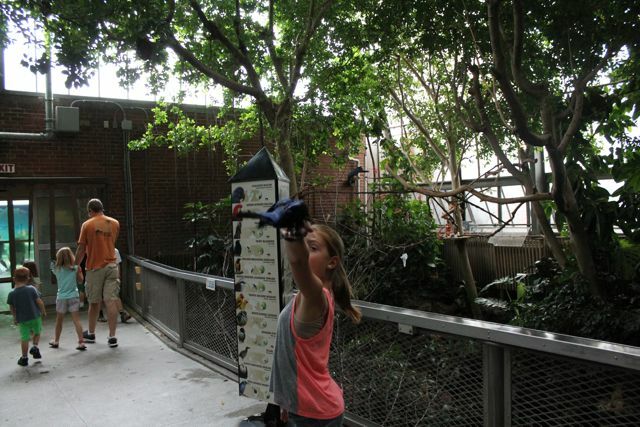 The National Aviary offers guests the opportunity to view feedings throughout the day. 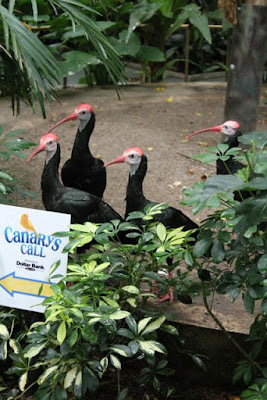 The Southern Bald Ibises were ready for some worms. 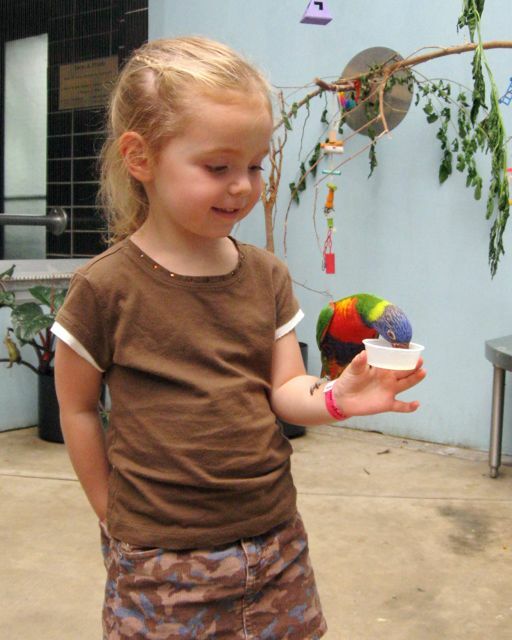 My daughter was given a mealworm to hold in her hand. 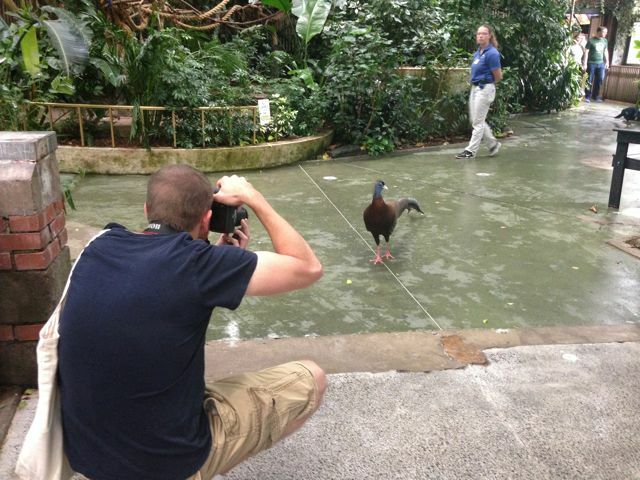 A bird swooped down to get it! I think she was surprised! 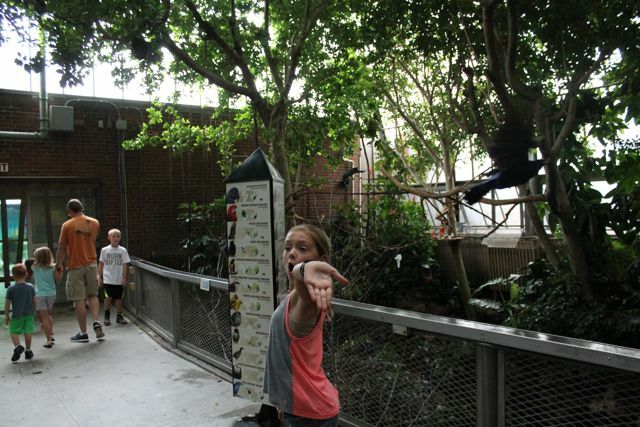 She probably doesn't remember this but she was surprised by a bird once before at the National Aviary. 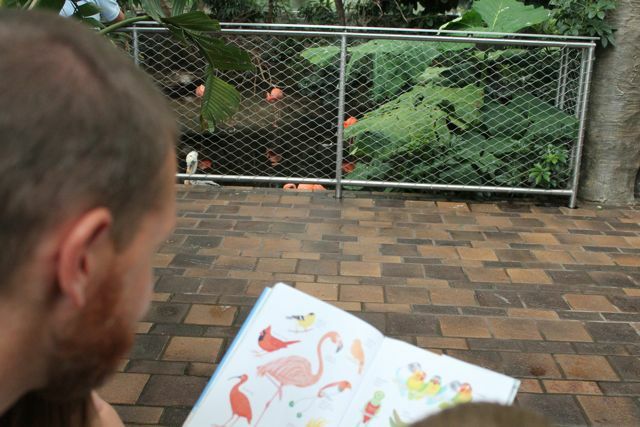 We took a moment to read a A Bird is a Bird in the Wetlands Room. 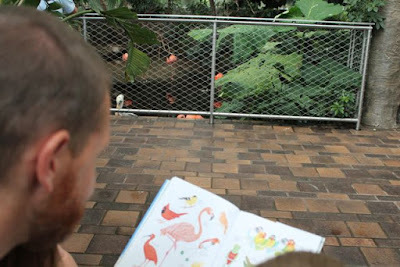 The flamingos and pelican looked on as we read. 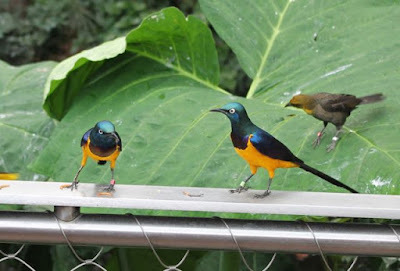 Colorful birds having a snack. Can you guess who he got to feed? I think I heard him say, "Thank You!" A super fun day with a super fun book! This week she found the perfect book for the First Day of School, too. Lizzy, I am so happy we connected at Mazza! We all had a great time reading your books this week! (Even my 11-year-old sat and read through a stack of your books and said, "She writes some good books!") We hope you have a wonderful birthday. Send us a picture of your birthday cake!